MALORIE, PLAYED by Sandra Bullock, leads two children to safety. In the past few weeks, another Netflix original took the internet by storm. 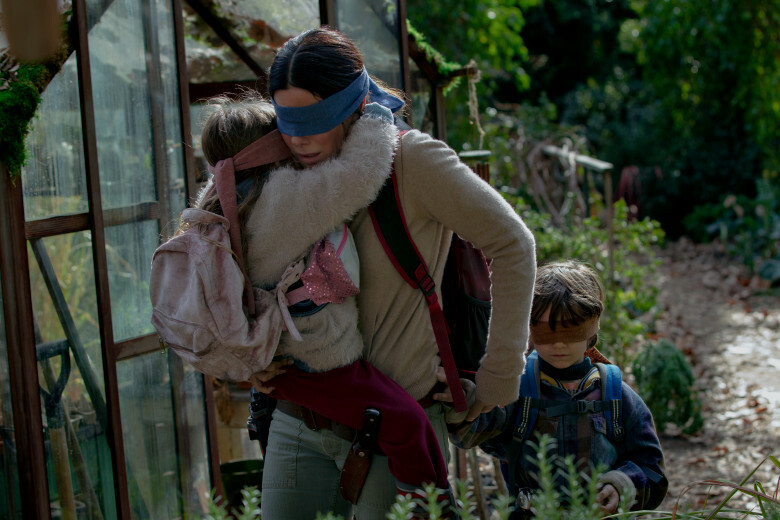 But, this time, rather than a wholesome romance or a playful Christmas movie, it was a thriller: Bird Box. The iconic story revolves around an unknown force that causes anyone who sees it to instantly kill him or herself. The viewer follows Malorie, played by Sandra Bullock, as she and a few other survivors navigate the world without being able to look outside. The most interesting part of the movie’s story-telling was it’s switch between two storylines: when the disaster first began and five years later, when Malorie and her two children are traveling to safety down the river. This is where the movie loses its value. Through the switch between timelines, they lose the suspense of the river scenes, where the eerie uncertainty was amazing. It also devolves the emotional attachment created in the earlier storylines between Malorie and another character, Tom. The deep conversations and romantic development aren’t strong enough to create an emotional attachment from the viewer. Instead, they just disturb the only well-done aspect of the movie: the action. In my opinion, the action scenes and thrilling atmosphere are what carried Bird Box to its popularity. The concept behind the story and the execution of the limited vision of both the viewer and the characters create an eerie atmosphere that makes the movie—though not perfectly done—still intense and thrilling to watch. The performances given by the actors, even Vivien Lyra Blair and Julian Edwards, who played Boy and Girl, Malorie’s two children, also contribute to the undeniably interesting aspects of the movie. Each character was believable, the fear and tension between them felt as if it was real. The tears, screams, and pauses were thick with what felt like genuine emotion. Blair’s performance stood out as impressive, especially from someone so young. Overall, though some aspects were excellent, I was disappointed by Bird Box. I never felt attached to the characters, and I didn’t feel invested in the main relationship between Malorie and Tom. I found Malorie’s tense relationship with her children to be cruel and harsh, rather than necessary or understandable. I found myself bored, waiting to see river scenes again. Overall, the movie seemed to lack commitment to either its dramatic side or its thriller side, and had they focused on one and done it well, it would have been far more enjoyable to watch.